Abraham Lincoln's famous line, which he drew from scripture in 1858 as a contest took shape over the future of the Union, bears repeating ahead of a contest of a different sort, one waged in voting booths rather than on a bloody battlefield. Families are again divided. Of course, they often are; home life is messy. That these divisions are being aired as a method of political persuasion, however, is a measure of the contention marking American life as the midterm elections approach. The latest domestic volley came Monday, when 12 family members of Adam Laxalt, the Republican candidate for governor in Nevada, published an op-ed in the Reno Gazette-Journal urging the state's voters to reject their own kin. They based their appeal not just on their relative's public positions but also on his personal character. They accused him of "phoniness" and "self-serving political purposes." "The decision to write this column has not been an easy one for us," wrote the candidate's family members, a group that includes a family medicine physician, an educator, a lawyer, a mental health therapist and an artist. "We are writing as members of the Laxalt family who have spent our lives in Nevada, and feel compelled to protect our family name from being leveraged and exploited by Adam Laxalt, the Republican candidate for governor." Laxalt, Nevada's attorney general, enjoys a slim polling lead in his race against Democrat Steve Sisolak, a businessman and county commissioner. The op-ed was the latest proof that family loyalty is losing out to political difference. The bitter, take-no-prisoners approach was distilled in a video advertisement last month in which six people endorsed David Brill, a Democratic congressional candidate in Arizona, only to reveal at the end of the spot that they were siblings of the opposing candidate, incumbent Republican Rep. Paul A. Gosar. 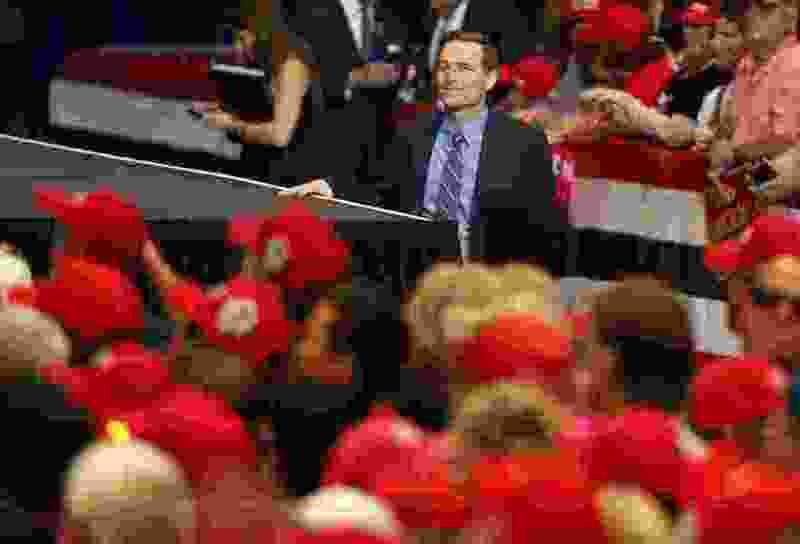 Parker Briden, a spokesman for Laxalt, said in a statement to The Washington Post that the candidate "has a large family and some distant relatives are lifelong liberal activists, donors and operatives." He added: "Adam's record of protecting Nevada seniors, veterans, and women is far more in line with Nevada's values than Steve Sisolak's support for raising property taxes, his doubling of student tuition and his pattern of pay-to-play politics - for which he was called corrupt by a judge." The judge in question, Robert Jones of Federal District Court, scolded Sisolak and his fellow Clark County commissioners in 2010 for their handling of a road-widening project, accusing them of acting "corruptly," a charge that Sisolak said was a mischaracterization. The column in the Gazette-Journal - by an aunt and cousins, among other relatives - anticipated the campaign's riposte, arguing that it "would be true" for Laxalt to claim he "hardly knows the people writing this article." "We never had a chance to get to know him, really - he spent his life in Washington, D.C., while we lived in Northern Nevada and grew up in public schools and on public lands," they wrote. In a campaign video, Laxalt speaks about being raised by a single mother, Michelle Laxalt, a Washington lobbyist who has appeared at campaign events with her son. Born in Reno, Nevada, and raised in the nation's capital, Laxalt, 40, describes himself as a "fourth-generation native Nevadan." He is also a Navy veteran. But his family members accused him of being less attuned to "Nevada's values" than to "those of his out-of-state donors." He is the grandson of Reagan confidant Paul Laxalt, who served as both governor of Nevada and as a U.S. senator and died in August. The column hits Laxalt hardest for his stance on immigration. As attorney general, he opposed former president Barack Obama's deportation deferral program, and, under President Donald Trump, he has supported the administration's efforts to penalize sanctuary cities. His family members said Laxalt's position was at odds with his own family's history. Laxalt is the great-grandson of Basque immigrants who ventured to the U.S. in 1900. In his campaign launch, the candidate spoke of his great-grandfather, "who came from the Basque country to the hills of the Sierra Nevada and went on to be a sheep herder and rancher." "In the face of Nevada's history as a state made of newcomers, including our own immigrant forbears, he has advocated against immigrants as well as against businesses and individuals who have moved here from other states," the column states. At the same time, the authors accused Laxalt of exploiting his Basque heritage by holding an annual fundraiser billed as a "Basque Fry." This year's event featured Kellyanne Conway, counselor to Trump; Rep. Devin Nunes, R-Calif., the Trump acolyte and chairman of the House Intelligence Committee; and Dana Loesch, a spokeswoman for the National Rifle Association. In jeans, work books and a shirt monogrammed with his campaign logo, Laxalt aimed "to project an image of authenticity, of a deep family tie to Nevada and its history," his family members observed. "But it's all fake, all props paid for by someone else." The event was put on by the Morning in Nevada PAC, whose donors include the NRA. His family members also took aim at Laxalt's career as a lawyer and attorney general. They pointed to a performance evaluation that described Laxalt as a "train wreck." They said his time in statewide office "has been little more than a four-year publicity tour for his current campaign for governor." He describes his tenure differently, saying that he has used his role as attorney general to "protect those who most need protecting" and citing his efforts to reduce the sexual assault kit backlog. There is scarcely an issue on which his family members spared him - from health care to public land to education. But most of all they impugned his character and intentions, writing of his "self-serving political purposes" and "servitude to donors." They claimed not to be motivated by partisanship, saying they would be "proud" to have a family member, Democrat or Republican, running for office, "so long as we believed that they would be good for Nevada." The column is narrowly focused on Laxalt, not mentioning his opponent. But its individual authors have previously spoken out in support of Sisolak, as well as donated to his campaign - endorsements that the Democratic candidate has publicized on social media. The Republican's aunt, Kevin Marie Laxalt, a professor at Great Basin College in Elko, Nevada, appeared earlier this month in an ad for Sisolak. Meanwhile, the candidate's cousin, Monique Laxalt, said she and others felt "an obligation to speak out ... lest there be any misunderstanding that because he carries our family name, he represents our family's values." Sisolak's most recent campaign finance disclosure shows that members of the Laxalt family have donated hundreds of dollars to his campaign. Steve Sisolak tweeted "Thank you, Dr. Kevin Marie Laxalt, for standing behind my plan to put Nevada families first. #NVGov"